March 15, 2018 By Allyson 53 Comments This post may contain affiliate links. Read my disclosure policy. With only a handful of ingredients, this Easy Homemade Bread Bowl recipe is simple, tasty, and freezes well. Fill with your favorite soup, like Broccoli Cheddar, and dinner is served! Great Value Broccoli Cheddar Soup makes a great filling for this Easy Homemade Bread Bowl recipe which is made with only a handful of ingredients. These Easy Homemade Bread Bowls are perfect for when you want to indulge at home, and not break the bank at a restaurant. Pair this delicious homemade bread bowl with some hearty soup, and you have a winning meal! Today’s post is sponsored, but as always all opinions are my own. I was so excited to find out recently that Walmart has a new line of fully cooked soups under the Great Value brand in the freezer section! All you have to do is heat and serve! What’s even better? The price! Prices at under $5.50 for FOUR servings, this is a total steal! They carry a variety of soups, but Broccoli Cheddar and Tomato Basil are my absolute favorite! They have been developed to compare to those you can get at a restaurant, and I really can’t tell the difference! Make sure you scroll all the way to the bottom of this post for your chance to win a gift card! Using a stand mixer or large mixing bowl, add warm water and sprinkle in yeast. Let the yeast dissolve for a few minutes until yeast becomes foamy (You only have to do this step if you are using regular yeast, not fast acting. If you are using fast acting, just sprinkle it in the water and move to next step, no waiting needed). Add butter, sugar, and salt, then mix well. On the lowest speed, slowly add the flour until completely combined. Remove paddle attachment and insert the dough hook. On a medium/high setting, ‘knead’ the dough for 4-5 minutes or until smooth. Place the dough into an oiled bowl, then cover with a damp kitchen towel. Let the bread sit for 45 minutes in a warm dry place. Remove the towel and punch the dough down in the center. Remove from the bowl and cut into 6 even sections. Form each section into a small ball. Place the dough balls on a lightly greased baking sheet, a few inches apart. Cover loosely with damp towel, and allow to rise again for 40 minutes. Brush an egg wash all over the tops and sides of the bread bowls, then sprinkle with your favorite herbs. I like oregano and thyme. Place in a preheated (400 degrees) oven, and bake for 15 minutes. Remove and brush again with the egg wash. Place back in oven and bake 10-15 additional minutes, or until tops are browned and slightly crisped. Remove and cool on a wire rack. You have a few different options on how to cook the soups! On the stove top: Remove container from outside packaging. Place sealed plastic bag with soup into a pot of boiling water. After a few minutes, remove and serve! In the microwave: Remove container from outside packaging, but keep plastic bag in the black plastic container. Microwave in bag, then pour soup into black container. Microwave a few minutes more until cooked through. *For specific times, see package instructions. Once the bread bowls have cooled off, you can cut a pocket out of the top center, and then pour the Broccoli Cheddar Soup into the bread bowl. I love how the Great Value Broccoli Cheddar Soup comes with croutons to add to the top, too! The broccoli cheddar soup is made with broccoli florets and carrots blended with whole milk, cheese and seasonings, then slow cooked to obtain a perfect balance of tender broccoli and a velvety smooth cheddar cheese sauce- it’s delicious! Using a stand mixer or large mixing bowl, add warm water and sprinkle in yeast. Let dissolve for a few minutes until yeast becomes foamy (You only have to do this step if you are using regular yeast, not fast acting. If you are using fast acting, just sprinkle it in the water and move to next step, no waiting needed). Add melted butter, sugar and salt and mix until combined. Gradually add flour. Once combined, allow your mixer to knead the dough for about 5 minutes (you could do this by hand if you weren't using a mixer). Punch dough down, and divide into 6 equal portions. Shape each portion into a 4 inch round loaf. Place loaves on lightly greased baking sheets sprinkled with cornmeal. Cover with damp towel and let rise in a warm place, free from drafts, until doubled in bulk, about 35 minutes. Preheat oven to 400 degrees F. In a small bowl, beat together egg white and 1 tablespoon water; lightly brush the loaves with half of this egg wash. Sprinkle with any seasonings you may like (I use thyme and oregano). Bake in preheated oven (400 degrees F) for 15 minutes, remove, and brush with remaining egg mixture, and bake 10 to 15 more minutes or until golden. Cool on wire racks. To make bowls: Cut a 1/2 inch thick slice from top of each loaf; scoop out centers, leaving 3/4-inch-thick shells. Fill bread bowls with hot soup and serve immediately. Time for the fun! Comment below and tell me which Great Value Soup is your favorite or your favorite way to serve the soup and you will be entered for your CHANCE TO WIN a $50 Walmart Gift Card!!! This is a sponsored conversation written by me. The opinions and text are all mine. that would be helpful wouldn’t it? 400 degrees! I was just talking to my husband about trying my hand at making these today! I cant wait to try this out! I finally got around to making those bread bowls and they came out perfect! Dang girl, come make dinner at my house! Allyson, these look wonderful – I’ll bet they would fabulous filled with chili, too. I’d really love to try these! Thanks so much for sharing and pinned! Thanks so much, Cindy! 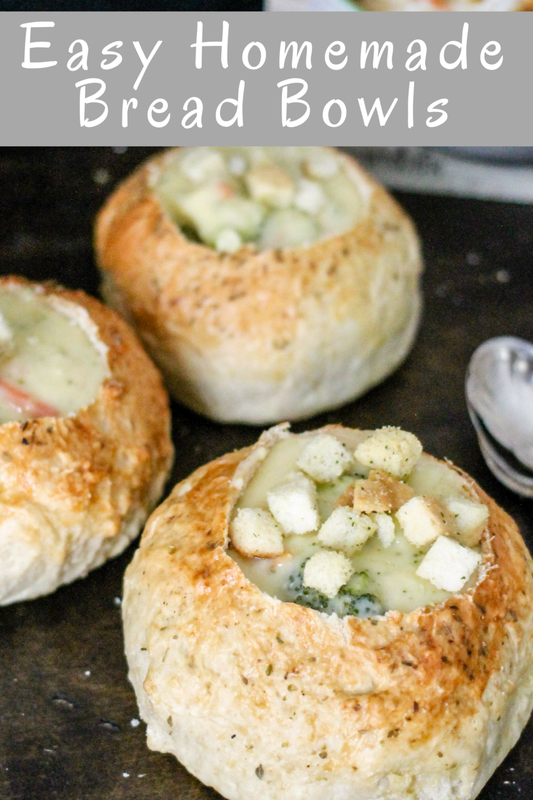 They really are delicious and it’s the perfect time of the year for some comforting bread bowls! Tried this today–absolutely delicious and very easy!!! Thanks for sharing. Pinned it to my Bread board. I will certainly give this a try. Bread bowls, soups, stews, and chili all go great with this winter weather! The broccoli cheddar sounds delicious! 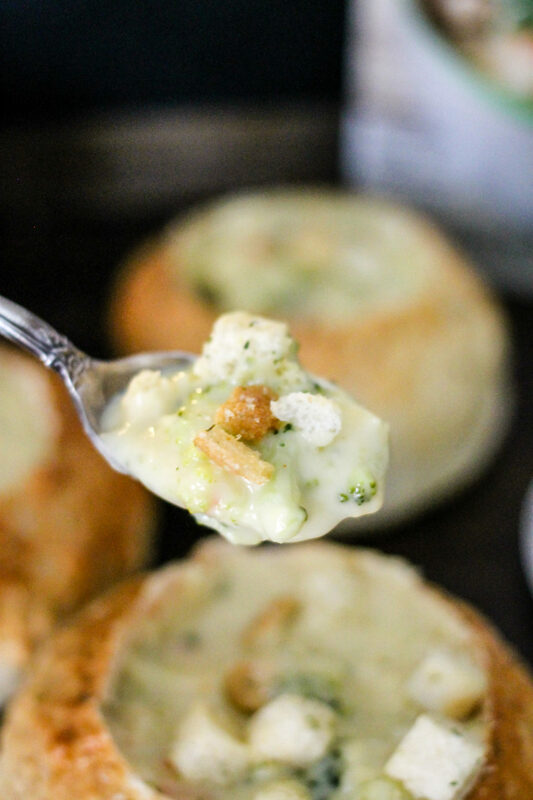 Broccoli cheese soup in any easy edible breadbowl = awesome in my world! Thank you for the recipe! Such a great way to serve soup! Pure comfort food! I’ve always bought bread bowls but haven’t ever tried making them at home. Thank you for sharing! Can’t wait to make them and try that broccoli and cheese soup! These look adorable! Must try it! Bread bowls are so fun! I can’t wait to make these soon! I love bread bowls when I’m out and about – can’t wait to try your recipe! I think the broccoli cheddar is my favorite! Wow does this ever look good! I love Tomato Basil, and it would be so good with BLT sandwiches! I love Great Value, it is my favorite brand better than name brands for both quality and price! My all time favorite soup is French onion but broccoli cheese is a close second! I serve both with a big piece of crusty bread, yum! 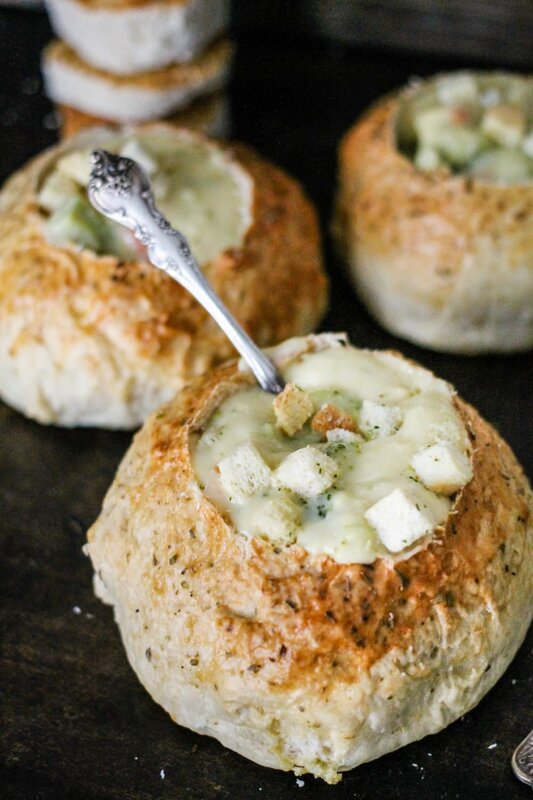 I’ll have to give these bread bowls a try! Beer cheese soup is my favorite! Wow! This looks amazing! Unfortunately these soups aren’t available in my area but both the broccoli one and the tomato one you mentioned sound super yummy. I will have to keep my eyes open. In the meantime I would fill my bread bowl with some good old fashioned potato soup! I love broccoli and cheddar so much. I could eat it all winter long. 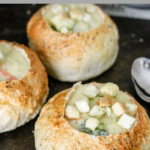 I’m going tho have to try to make these bread bowls. Will have to see if I can make it gluten free I miss bread bowls. My favorite is potato soup! My favorite soup is my grandmother’s potato soup. But I’m going to try the broccoli cheddar for sure! This looks delicious! 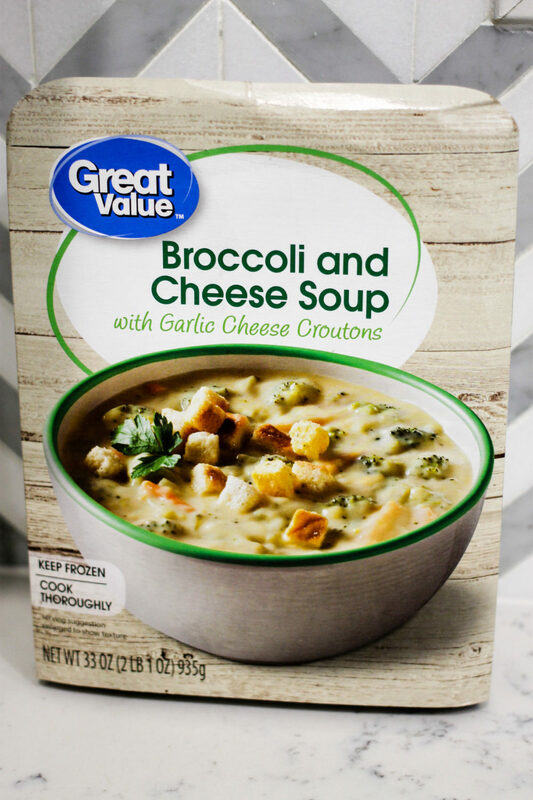 I think I’d have a tough time choosing between Great Value’s loaded baked potato soup and broccoli cheddar soup, so I’d need to make two. These look amazing! My favorite creamy potato would be insane in here!! These look delicious! My favorite soup is a creamy chicken noodle! Creamy tomato soup is my all-time favorite. A homemade chicken noodle or potato soup are my favorites! There’s a great value chicken and dumpling soup that is the BEST. I am in love with chicken and dumpling anything and it’s so much cheaper than the name brand. FRENCH onion and broccoli cheddar are my favorites! I Cant pick just one lol! This looks so delightfully awesome. Everything is better in a bread bowl. Clam chowder or broc cheddar! Those bread bowls look amazing. I think I’ll try them and fill with my favorite split pea with ham soup. Clam chowder is my favourite, or a good split pea soup (Canadian specialty)! This is such an amazing idea! Can’t wait to give this a try! Thank you for this recipe! I just made this and it was perfect! Super easy to follow and turned out delicious! I think bread bowls will be a new thing for us now! Thanks again! You are welcome! I am glad you loved them as much as we do, they are a staple around here! I’m in the process of making these to go with my outback clam chowder. I can tell the dough is more sense than my regular bread recipe, but I’m going that is too help it hold its shape while in the oven. I can’t wait to see the end result! How did they come out? I hope you enjoyed them! This was such an easy bread bowl. I would recommend having a stand mixer, though, or some admirable upper body strength! The dough is a stiff dough, but it rises beautifully. If you have a dehydrator, take out all the shelves and turn it to 110 degrees and proof your dough in it. Flawless. The outside of the bowl had that nice hard crust, while the inside was beautifully soft. I will make these again and again! Made these today to go with Chili! Super easy! I have not baked them yet. Can I do a reg egg wash? You can feel free to make them into however many bowls you’d like! I like to keep it in one serving portions otherwise I can’t control myself! Enjoy!